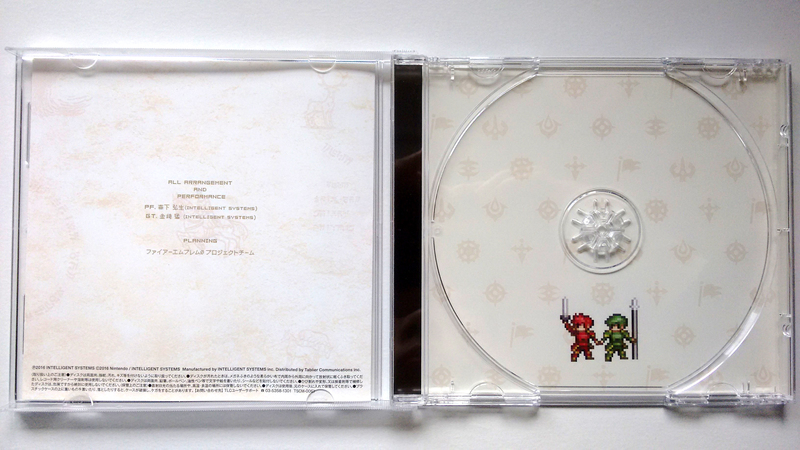 The front of the CD is simple and effective. 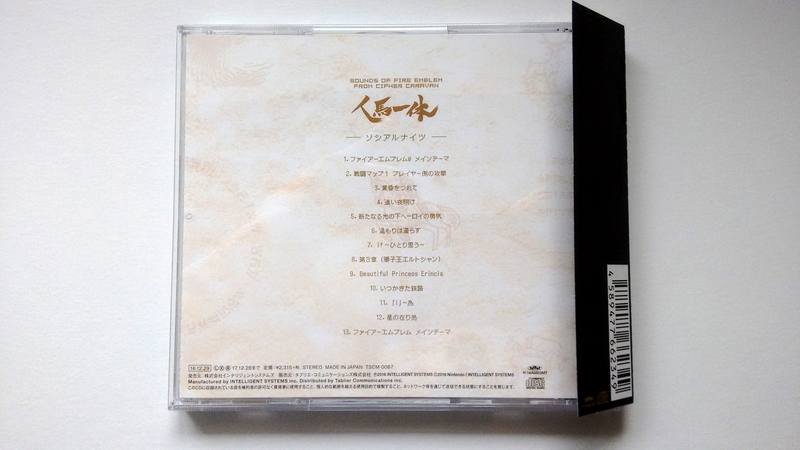 Along the top is the title of the CD; by the way, “Horse and Rider as One” is a rather crude translation–as we understand, it’s meant to refer to the Cavalier and his steed being one entity. Below the title is the artist–the “Cavalier Duo”. 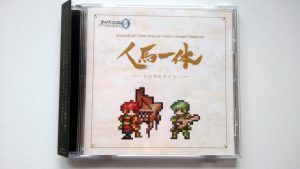 The bottom half features adorable pixel art of Cain and Abel playing the piano and guitar, which is a reference to the instruments Morishita and Kanazaki use during their performances. On the reverse side is the track list. It’s a bit hard to see from the photographs (sorry, the forest wasn’t very bright at the time), but the background is based off the ancient murals in Awakening, seen in background materials. 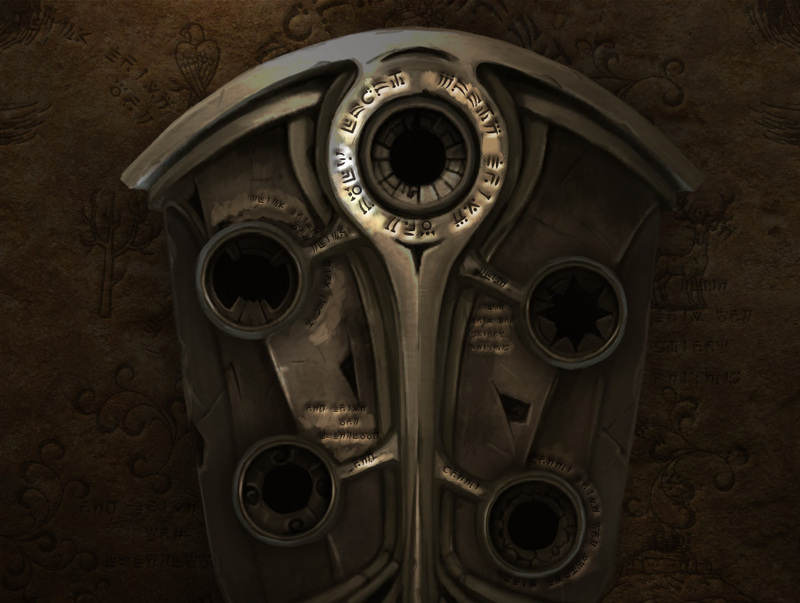 In fact, if you take a look at the ancient text, it’s just the same writing found on Awakening’s Fire Emblem. Which is sort of lazy, but it looks cool, which is the important thing. Inside, we get a good look at the CD itself, which again features sprite art of the Cavalier Duo, plus the various Cipher faction icons. For those that don’t follow Cipher, the icons are: the Brand (Awakening), Hoshidan and Nohrian crests (Fates), Blade of Light (Shadow Dragon etc. ), Divine Weapon (Binding Blade etc.) and Holy Flag (Genealogy etc.). When you take out the CD, you can see the faction icons more clearly and the pixelised Cavalier Duo in an alternate pose, holding their weapons up. Somebody obviously had a fun time drawing those sprites! 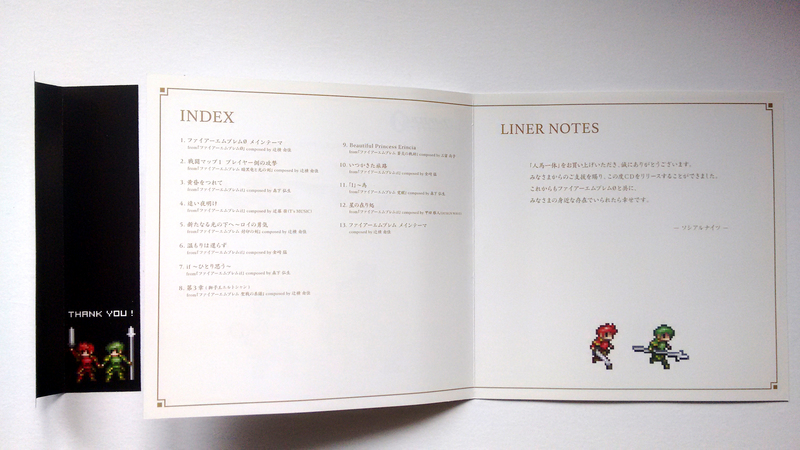 Next, let’s take a quick look inside the booklet at the front of the CD. On the left side, there’s the track list again in case you needed it, while on the right side is a message from the Cavalier Duo accompanied by more cutesy sprites. You have our deepest thanks for purchasing this “Horse and Rider as One.” We were deeply honored to have all your support, and thanks to that, releasing this CD was possible. It brings us the greatest joy that we can feel close to you all through Fire Emblem Cipher. Meanwhile, inside the black obi strip is a pretty neat “Thank You!” message. 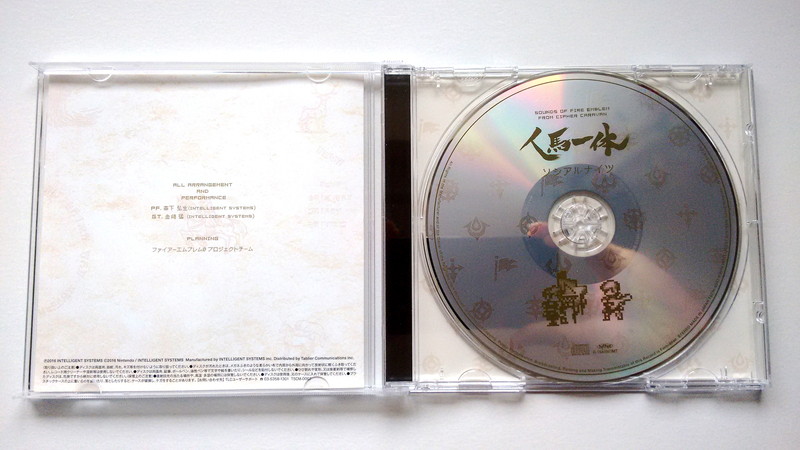 Moving on to the most crucial part of the package: what’s inside the CD. Rather than try to explain everything, you can find a sample of the included tracks right here. 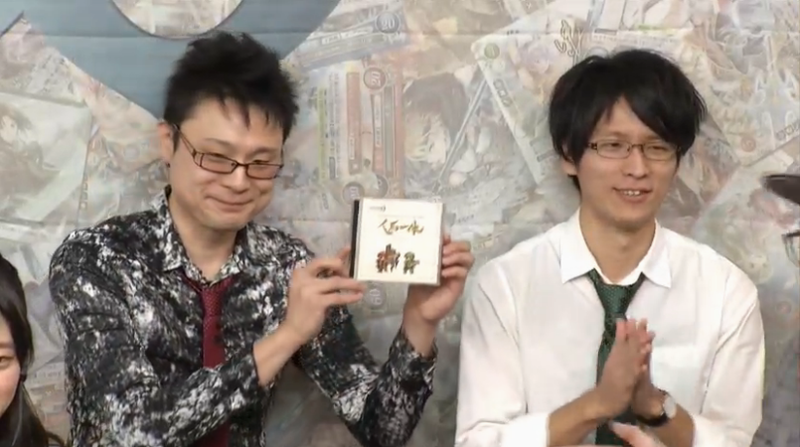 While you can no longer buy this specific CD, if you want to support the Fire Emblem sound staff, you can purchase the official soundtracks of Awakening, Fates, Path of Radiance and Radiant Dawn from places like CDJapan. 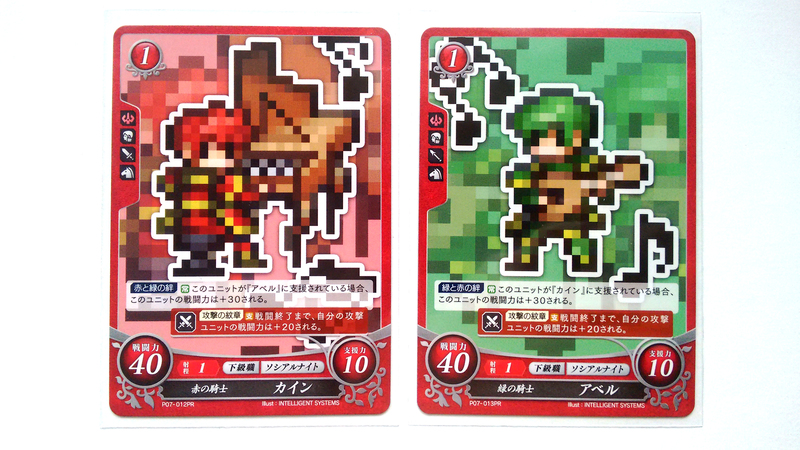 Finally, each CD comes with a pair of Cipher promotional cards of pixel Cain and Abel. These are simply versions of their Series 1 cards with alternate artwork. However, they’re sure to be a talking point if you have these in your deck. 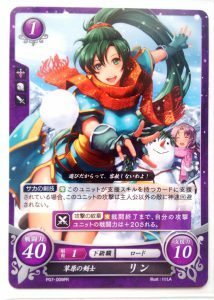 Not directly related to the CD, we were also given a promotional card of Lyn, available to anyone who made a purchase at Comiket 91. We like to think Lyn is having a fun snowball fight with you–the player. It makes sense, right? 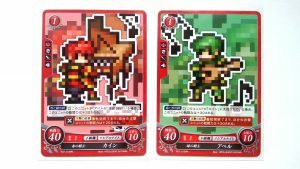 On a final note, the Cavalier Duo will make an appearance at the upcoming Cipher Festival 2017 events as well. Anyway, we hope you learned something–and enjoyed some awesome music while you were here! Great soundtrack, thank you for uploading it. Damn, that soundtrack is amazing. In particular, the upbeat jazz rendition of hitori omoo and the id purpose piece are amazing. Who wants to bet we’ll start finding it on Amazon/eBay over the next couple months at skyrocketed prices? Who wants to bet we’ll all fight for it anyways? http://www.ebay.com/itm/122297945366 <- for anyone interested in getting a copy, just bought one for myself.